Save up to 20% on Ski Rentals! Christy Sports will come to you or you can stop by any of their convenient locations and take advantage of the 20% discount you receive as our guest. At Black Tie ski rental you will receive a 15% discount. 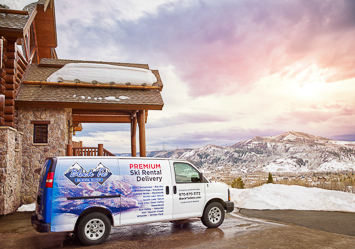 Plus, they will fit you at your residence so it is the easiest ski rental experience. Want to Truly Relax on Vacation? Try our legendary VIP catered chalet package. One of the greatest benefits that our VIP Catered Chalet package offers is the time that you save, which translates to the vacation time that you gain. Consider what value you place on an hour of your time. Would you prefer to spend a great deal of your vacation doing daily chores? Or, would you like to get the very most of your skiing time and spending time with your friends and family? Private chef for the week, chalet hosts, private vehicle service including airport pickup, food snacks, drinks - all included!